Path to Wellness, a corporate wellness training program developed by Executive Medicine of Texas, wins award for influencing leaders to pay attention to health. Drs. 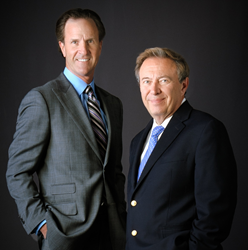 Mark Anderson and Walter Gaman are founding partners of Executive Medicine of Texas and leaders in preventative and proactive health. Executive Medicine of Texas is recognized for their efforts in improving the health of busy leaders. Distinguished recipients of the Leadership 500 Awards for 2015 were named for outstanding achievements in leadership development and programs at the LEAD2015 forum held at the Four Seasons Hotel in Dallas, Texas. Executive Medicine of Texas took third place in the small company category for their Path to Wellness program, a leadership motivation program that encourages better health through targeted educational workshops. This year’s award winners have been published in the April edition of Leadership Excellence Essentials. For the past 30 years, Leadership Excellence, now a part of HR.com has identified and recognized the top 500 leadership organizations and their strategies and solutions in their yearly ranking. The Leadership Excellence publication will also feature interviews from select top award winners, including Executive Medicine of Texas, in this year’s upcoming July issue. The interview will outline the program’s unique qualities that make it a Leadership 500 Winner. Other winning programs will also be featured in the issue. “We were pleased to have a large increase in applicants this year and have only published the top 500. I think the Leadership500 Awards in combination with LEAD2015 demonstrates top organizations that not only value leadership but also have innovative programs,” stated Debbie McGrath, CEO of HR.com. This year’s award recipients were selected based on both an application or nomination process, reviewed by HR.com’s expert leadership panel, as well as feedback from the program’s participants. The voting was promoted by the nominees as well as through social media campaigns over the course of the nomination period. Executive Medicine of Texas is a leader in preventative and proactive health. Located in Southlake, Texas, they work with companies from around the globe on corporate wellness training for their leadership. Their executive physical exams and corporate wellness programs help companies of all sizes improve their health, which can also increase the company’s bottom line. Founding partners Drs. Mark Anderson and Walter Gaman aside from their busy practice, co-host the nationally syndicated Staying Young Radio Show. HR.com, the largest global social networking and resource site for HR Professionals is committed to providing a deeper understanding of the HR function for 250,000 members by offering a Global Leadership annual event, Leadership500 Awards, an innovative Personal Excellence app, 12 interactive Excellence Essentials monthly e-publications, SPHR/PHR certification prep courses, 4,000+ webcasts, 300+ virtual conferences, blogs, community networks, industry news and advisory boards.